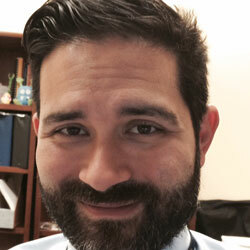 In our latest interview with Frank Fajardo, MA, MPA, MLIS, Information and Instruction Services Librarian at Florida International University, we explore how a self-described comic book “geek” went from researching ordinances and policy initiatives for local politicians to a fulfilling career helping others. Starting a new library at a new medical school is no easy task, but with Frank’s dedicated passion and positive thinking attitude, he has seen the library evolve into a major resource for medical students and staff seeking evidence based sources and support. Read our latest interview with Frank from FIU here. My initial interest came from my desire to help others. In my past career, I was a legislative analyst researching ordinance and policy initiatives and their impact on local municipalities. Researching and evaluating information for elected officials set the tone for helping others. I was a detective in a way, and I liked it. Information and research literacy are essential, especially among health care providers. What are some of the ways you help library patrons spot misinformation and faulty research? We evaluate resources together, and spend the time to look at how current and relevant the information is. I will ask, did you look at multiple resources? What due diligence did you do? Where did the information come from? And we take it from there. It’s important to be thorough during the research process. We did some snooping around and learned that you helped launch FIU’s interlibrary loan service in 2009. This must have been a daunting, yet essential step for the success of the library. What other programs or processes have you helped implement since 2009 that are now key to the day-to-day library operation? Hiring the first staff member to manage our help/reference desk was a huge addition to our small team; I am very proud of that! Also managing our circulation and course reserves has had a huge impact since I introduced it many years ago. Medical librarians are becoming more active in clinical education, supporting faculty in various ways. Assisting in the development of evidence-based courses, starting journal clubs and rounding with residents are just a few examples. Have you seen this type of effort at FIU? If so, can you please describe a few of the current activities and share your thoughts on how this has been received? The Medical library staff and I are heavily involved in the EBM classes not just for the med school but also the PA programs. We teach how to go through a clinical scenario and how to put together a clinical question. We try to infuse the curriculum by working with our faculty to communicate all available resources we have to help support our students and make sure they have the best evidence to answer those questions. Seeing something grow from its infancy to where it is now. I started with the medical library on day 1 over 10 years ago and seeing where the library is today and where it is heading has been as rewarding as helping others. We are a small team and handle a lot and wear multiple hats. It’s a very large school and growing day by day. Supporting our students and faculty can be very daunting, but we try to instill our saying that when it comes to research, librarians are your best friend. That makes life a little easier. Keeping up with technology is the biggest challenge we face. It is becoming less about the computer and more about tablets and cell phones. Access to information at your fingertips is a positive change, but we have to make sure we can keep up with it. Telemedicine is changing so fast and we (librarians) are all a part of it, and it is up to us to stay current. I would say to keep current with what is out there. Go to conferences and speak with vendors, see what it is new and how it can help support your faculty and students. We have the ability to push these resources as long as we know what our faculty is looking for. As the Instruction and Information Services Librarian, I oversee all reference and teaching activities for the Medical Library. This includes all library-related instruction in our medical school and the Physician Assistant program. In addition, I am involved with faculty development including professional development workshops and working with our residents at our affiliate hospitals. My daily tasks really revolve around instructing faculty and students on various databases, point of care resources and mobile resources—especially those that look at clinical scenarios—that are available to them through the library. I absolutely love comics and comic book movies! I am a proud geek and love all that Marvel and DC Comics have to offer. Other than comics, I love to jog and go for long bike rides all over South Florida. Working on my PhD has been taking a lot of my time as well.